Join the Shakti Community at Their New Location Come Celebrate the Divine Feminine in All of Us! Joshua Tree, CA – February 20, 2019 – The Shakti Fest community of yogis, meditators, conscious parents, and spiritual seekers comes back together for its ninth season, this year on Mother’s Day weekend – May 9 – 13. The 2019 Shakti Fest is at a new location, on the southern edge of the Mojave Desert – offering panoramic views of the North face of Joshua Tree National Park, exceptional desert vistas, and spectacular night skies at the Joshua Tree Lake RV & Campground, in Joshua Tree, CA. 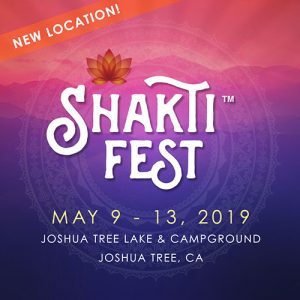 Organized by Bhakti Fest, recently surpassing 10 years of producing conscious events, Shakti Fest is a unique springtime celebration. Driven by the divine feminine spirit, described in Eastern philosophy as the ‘dynamic force which moves the universe’ Shakti Fest features world famous yoga teachers, sacred music stars, spiritual and emotional growth workshops, sound baths, a healing sanctuary, and much, much more. “We are so fortunate to be staying in the sacred vibration of Joshua Tree. Shakti and Bhakti Fest are all about heart centered community, a conscious and uplifting experience and the amazing line-up of artists, teachers and presenters in a family friendly drug and alcohol-free environment. We expect to offer the same amazing experience our events have always been known for” noted Sridhar Silberfein, founder of Bhakti Fest. The Shakti Fest 2019 music lineup inspires attendees to sing, dance and open their hearts. This year’s line up once again includes the best Kirtan (a.k.a. chanting) artists on the sacred music scene: Jai Uttal, Donna De Lory, MC Yogi, Saul David Raye, Amritakripa, Gina Sala, Bhagavan Das, Larisa Stowe & the Shakti Tribe, Govind Das & Radha, Girish, Jaya Lakshmi and Ananda, Gina Sala, Fannah Fi Allah, Kavita Kat MacMillan, Krishna’s Kirtan, David Newman, Sirgun Kaur, and Wicked Hanging Chads, with more to be announced. The centuries-old practice of devotional chanting is considered to connect humans with themselves, the universe, and spirit. The entire Kirtan line-up is available here. World-class yoga teachers are the heart of Shakti Fest, and spring in Joshua Tree is a beautiful time to practice in nature. With a multitude of yoga venues with classes from sun up to sundown, there really is something for everyone! 2019 Shakti Fest teachers include; Shiva Rea, Mark Whitwell, Mas Vidal, Kia Miller, Georgina Meister, Leeza Villagomez, Carmen Curtis, Hemalayaa Behl, Nubia Teixeira, Dr. Haridass Kaur Khalsa, Lisa Gniady, Dharma Shakti, Hannah Muse, Saul David Raye, Govind Das & Radha and local desert favorite Kristin Olson. Anyone can find their inner Shakti through energy invoking sessions in a wide variety of yoga styles. View the full yoga lineup here. Shakti Fest 2019 Workshops will cover a plethora of wellness and conscious topics including Ayurveda, spiritual nutrition, tantric energy, breathwork, Sanskrit, conscious relationships, women’s sexuality, bhakti art, and hoop dance, with internationally known speakers such as Michael Brian Baker, Mirabai Devi, Dawn Cartwright, Siva Mohan, Zoë Kors, Lorin Roche and Camille Maurine, Manoj Chalam, Peace Guardians, Sharanam, Josie Keyes, Meghan Mahealani Morris, Rana Nader, Sarah Marshank, Syamarani, Zach Leary, and Dharma Devi. Shakti Fest also offers gender specific workshops for Women and Men, creating dedicated sacred spaces, which allow for a deeper connection and expression with sisters and brothers in a safe space. For further workshop details please go here. In addition to the music, yoga, and workshops, Shakti Fest also supports a healing sanctuary offering a variety of bodywork and other wellness modalities (what’s a weekend exploring your divine feminine without a massage?! ); a sound temple where attendees can meditate to the healing vibrations of top soundbath musicians; plus the younger set can play and explore in the expanded Bhakti Kids Land where families enjoy a huge array of special kids programming daily; a Chai Tea lounge with proceeds benefiting Food for Life Vrindavan; immersive Dome experiences; and Bhakti Kirtan School, where top artists share methods of creating Kirtan for a deeper experience of this increasingly popular genre. There is no place like springtime in the high desert for a fully immersive, powerful conscious experience. Accommodation options include a huge area for car and tent camping under the amazing Joshua Tree stars. In addition, there are RV Sites with electric and water hook-ups, RV Sites with no hook-ups, Cozy Trailers, Bell Tents with an option to include cot & bedding, and fully styled out Yurt Tent Glamping (emphasis on the Glam in glamping!). There are also several hotels within a few miles of the property. Joshua Tree is also known for its variety of private homes to rent via sites like AirBnB including published modern masterpieces, rustic desert shacks, fancy Airstreams, and more. For info on accommodations please see https://bhaktifest.com/accommodations/. The Shakti Fest Eco Artisan Village offers vegetarian and vegan food vendors, yoga clothing and gear, jewelry, art and unique collectibles. The organizers pride themselves on running a green event, offering free water and mindful recycling practices. Early bird festival pricing is still available for Shakti Fest 2019, plus there are discounted tickets available for local residents, veterans, military, seniors, and students. Tickets are available at https://bhaktifest.com/buy-tickets/. 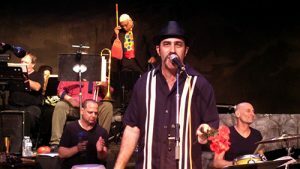 October 17, 2018, Santa Monica, CA – Noted for his long and busy career as a producer and music director Steve Weisberg is bringing his orchestra, with a who’s who of LA’s top session musicians, together again for a variety show style concert at Magicopolis, 1418 4th Street, Santa Monica, CA 90401, Wednesday November 14 at 8pm. Tickets are $30 and are available here. Joining Weisberg’s amazing 17-piece orchestra will be NRBQ founder Terry Adams, noted indie Latina singer/songwriter Gaby Moreno, Billboard Jazz Charting Ghanian-American singer Abiah, noted father/son act The Cages, Suzy Williams – long known and loved as the songbird of Venice, and up and coming singer Clara Zimm, with more special guests to be announced. Weisberg has extensive experience as an arranger and musical director on recordings and live events often for famed producer Hal Willner with artists including Sting, Elvis Costello, Marianne Faithful, K.D. 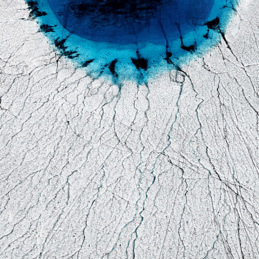 Lang, Macy Gray, BØRNS, David Byrne, Lou Reed, Carla Bley, Michael McDonald, Kesha, Tony Clifton, Howard Tate, Shane McGowan, Jill Sobule, Jackson Browne, Bill Frisell. and many, many more. Past SWO shows included performances by BØRNS, Victoria Williams, Jill Sobule, Petra Haden, Sussan Deyhim, Mocean Worker, and Perla Batalla, so attendees never know what surprise guests might pop up! 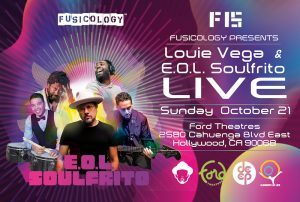 Los Angeles, CA – September 17, 2018 – With a packed schedule of private lessons, teaching nine classes weekly at three Equinox locations and Wanderlust Hollywood, traveling to teach at the Wanderlust festivals, and hosting several retreats annually, it’s a wonder popular LA yoga teacher Alex Dawson has time to catch an in-breath, let alone record an EP, but the three song “Om Mani Padme Hum” is set for release on October 5 on Spotify, Apple Music and all other major online outlets. Event sponsors include Magic Dates and Guayaki Yerba Mate. Instead of hot tea, Guayaki will be providing some of Alex’s favorite new flavor – sparkling grapefruit ginseng. 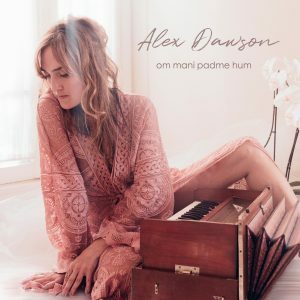 Currently, Alex is based in Los Angeles and teaches at Wanderlust Hollywood and Equinox where she often brings her harmonium for a closing Bhakti hit. She is inspired by people who recover from anything. That moment of transformation is her deepest call of illumination and is why she was so drawn to “Om Mani Padme Hum” as her debut EP. She travels worldwide to lead yoga retreats. Next up is her New Year’s Retreat in Mexico toasting in 2019, and later…Bali. 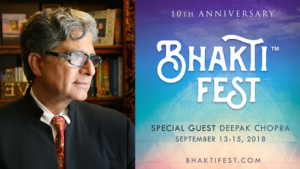 Joshua Tree, California – June 11, 2018 – The Bhakti Fest Group long known for its tradition of offering the best in yoga, sacred music, and conscious teachings, is thrilled to announce the special appearance of Dr. Deepak Chopra M.D., co-founder JIYO.com, at its 10-year anniversary celebration this September. Dr. Chopra, a world-renowned leader in mindfulness practices will lead a global meditation event from Bhakti Fest’s main stage. The Fest is held in the one of a kind beautiful high desert setting of the Joshua Tree Retreat Center, in a family friendly, drug and alcohol-free environment. These elements combine to create an unprecedented high vibration heart opening experience for all who attend. For more details on the Bhakti Fest 2018 line up and general festival information, visit https://bhaktifest.com/. Passes and intensive tickets are now available for Bhakti Fest 2018, with discounts offered to local residents, veterans, military, seniors and students, at https://bhaktifest.com/. Wolfe Island, Ontario – June 4, 2018 – One River, the musical project of noted New York City area retreat leader, poet, and musician Michael Quattrone, will be joining his fellow Wolfe Island Records artists for the 2nd Annual Wolfe Island Garden Party June 14 – 17. Sponsored by Wolfe Island Records and Wolfe Island Spring Craft Brewery, the four-day event features music from the label, along with lively discussions and events to deepen appreciation for nature, celebrate the island’s agriculturalists and raise awareness about the future of food. Weekend passes are a mere $20, available at many local businesses, and all proceeds will go to benefit the Wolfe Island Community Garden. One River will perform on Friday June 15 at 6:30pm at a wine & cheese reception at the Wolfe Island Gallery. Michael Quattrone will debut songs that speak to his spirituality, sparked at the threshold between inner life and outward expression. His set features drummer Jack Algiere who will give an agricultural talk, called, “Rhythm of the Garden” during the reception. Jack is the farm director at Stone Barns Center, in Pocantico Hills, New York. The eponymous, debut album includes ten original songs by Michael. It was produced by Hugh Christopher Brown and Michael Quattrone for Chris’s independent, artist-driven label, Wolfe Island Records. The idea for the record emerged after Michael invited the Canadian producer and multi-instrumentalist to collaborate on music for a retreat, and join a men’s group, at Hearthfire. Contributing to the album are longtime friends of Hearthfire and its intersecting communities, including Kala Iversen and Ashley Wood of Hearthfire; Jack Algiere of the Stone Barns Center for Food and Agriculture; Joseph Jastrab of the Hero’s Journey Foundation, and author of Sacred Manhood, Sacred Earth; as well as veteran musicians: Tony Scherr (Bill Frisell, Norah Jones, Kate Fenner), Gregor Beresford (Steven Stanley Band), Hugh Christopher Brown (Bourbon Tabernacle Choir, Pros and Cons project). Other notable appearances include Jane Scarpantoni (Lou Reed, Patti Smith), Rocky Roberts (singer-songwriter, guitar tech for Neil Young), and Michael Blake (Lounge Lizards, Ray Lamontagne). 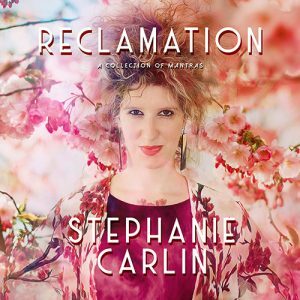 The record is ripe for release at this moment of cultural, socio-economic, and ecological upheaval, which demands the fullest presence of all of us to the outer- and inner- transformations underway. Wolfe Island Records’ founder, Hugh Christopher Brown will bring the likes of David Corley, Suzanne Jarvie, The Stephen Stanley Band, Jenny Whiteley, Joey Wright, Luther Wright, and himself to perform at multiple stages, on top of presenting two CD Release shows for debut records from newcomers Hadley McCall Thackston and One River. All of the above-mentioned artists created albums that were recorded in Brown’s old Post Office Studio on Wolfe Island. For info on all the Wolfe Island Garden Party festivities, please go to need link. 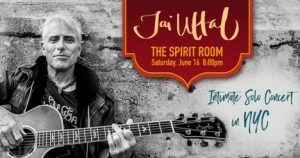 New York City – May 10, 2018 – Grammy nominated spiritual music pioneer Jai Uttal will perform his first New York City solo concert at the Church of St. Paul and St. Andrew, 263 West 86th St., at 8pm on Saturday, June 16. Stepping into a new and deeper level of vulnerability, Jai invites the audience into what he calls The Spirit Room, his solo acoustic concert, to share songs, instruments, kirtans, and stories from every phase of his inspiring musical and spiritual journey. From ecstatic love songs of the Bauls of Bengal, to dark banjo ballads of Appalachia, to the Bossa Nova kirtans on his 2017 release Roots, Rock, Rama! Jai promises an intimate heart space of communion, invocation and celebration. Tickets are $30-$65 in advance here. Jai is a favorite performer on the growing yoga festival circuit, playing to thousands each summer at Bhakti Fests and other events. He also leads his own workshops and retreats that deepen yogis’ practice of the heart based Bhakti yoga method, Kirtan, that is chanting the names of god to further enlightenment. With a unique boomer upbringing in the NYC music biz of the 50s and 60s (as a child he was at the session where Mitch Ryder recorded “Devil With a Blue Dress”!) Uttal understands true musicianship and has worked with top musicians including Bill Laswell, Don Cherry, and his musical guru Ustad Ali Akbar Khan, throughout his career. Additionally, his story flows with that of his generation – in the 70s he studied with Khan in the Bay Area while making extended trips to the Indian Ashram of Neem Karoli Baba the same guru who influenced Ram Dass’ classic Be Here Now. Maharajji, as the guru is known to his students, encouraged the practice of bhakti (devotional) yoga as expressed through kirtan, the call-and-response chanting of sacred names, over and over again until they become deeply instilled in the consciousness, providing an experience of profound peace and spiritual insight. The 80s were dedicated to his music career which took off in 1990 with his first album Footprints that featured Don Cherry and other notables, launching him into the exploding world music scene. Now, marriage, fatherhood, a Grammy nomination, and 28 years of worldwide acclaim later this return to New York City for The Spirit Room acoustic solo show continues his legacy. Wolfe Island, Ontario – April 12, 2018 – One River, the musical project of noted New York City area retreat leader, poet, and musician Michael Quattrone, will be joining his fellow Wolfe Island Records artists on a short Ontario tour anchored around the popular annual Canadian Music Week Wolfe Island Records showcase gig on May 9 at favorite Toronto roots music club Dakota Tavern.